A company called HyperV Technologies Corporation based in Chantilly, Virgina, USA, is working on a mechanical launch vehicle called the Slingatron. The Slingatron is a mechanical hypervelocity mass accelerator which can be used to launch objects (also called payloads) into Earth orbit at a significantly lower cost than what’s done today. Just like the early railroads which opened up remote areas here on Earth, the Slingatron mechanical launch vehicle can open up the next frontier, i.e. space. Launching into low earth orbit (LEO) requires accelerating a payload to 7.6 km/sec. Traditional approaches use rocket fuel which is terribly inefficient leading to only about 4% of the rocket mass for payload while the other 96% is for rocket fuel and giant propellant tanks. Slingatron negates the need for rocket fuel or fuel tanks. The Slingatron does this by a mechanical acceleration approach much like a classical sling. In the traditional case, a man twirls the sling above his head in an outward spiral accelerating the stone. In the Slingatron case, a mechanical motor does the same thing while the payload is on an outwardly spiraling railroad track that is mounted to the mechanical motor. Prior to launch, the Slingatron is gyrated to 40 – 60 cycles per second. Once the track is cycling at launch speed, the payload is lreleased onto the entrance of the track. The payload on the track quickly accelerates and centripetal acceleration causes the payload to spiral outwards following the spiral path at an ever increasing speed. When the payload reaches the final velocity at the last spiral turn, it is launched through an angled-up track directed towards space. 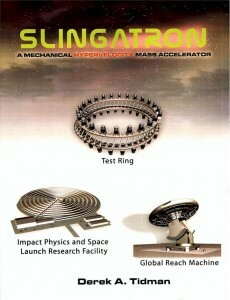 More technical details on the Slingatron mechanical launch vehicle can be found in a book called Slingatron – A Mechanical Hypervelocity Mass Accelerator by the inventor Derek A. Tidman that describes everything. HyperV tried to raise $250,000 via Kickstarter in August 2013 to build a larger version of the mechanical launch vehicle Slingatron but ultimately only raised $30,162. HyperV wanted to build an demonstrate a second generation prototype which can launch a quarter pound payload to 1 kilometer per second. Launching straight up, this could reach an altitude of almost 51 km. This does not mean the idea isn’t cool but rather probably a failure in marketing. The Kickstarter video is a bit dry and mostly involves two white-haired professor/researcher types talking about how revolutionary the idea is. The wow factor lies mainly in the idea and not in their presentation. The video here on their Youtube channel clearly shows how their mechanism works. Notice how the payload is fast enough that it punctures through the screen. One of their other projects on a new type of thruster was successfully funded, however, so do keep an eye on this company.